Enchantment Ink is pleased to introduce "Signed on the Dot: A Collector's Guide to Penrhyn Stanlaws." This brand new book, by Norman I. Platnick, attempts to gather together the known images by American illustrator Penrhyn Stanlaws. 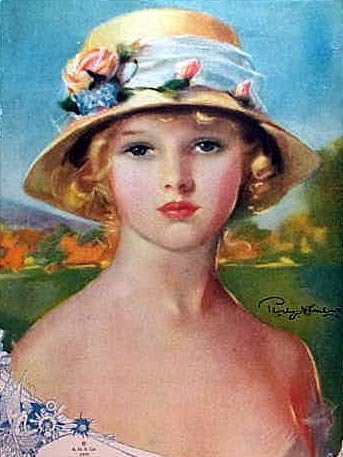 During the teens and twenties of the last century, Stanlaws was among the most famous illustrators in the nation; at one point, he was simultaneously the "house" cover artist for two major periodicals (Hearst's and Metropolitan magazines). He led a fascinating life, including stints constructing the Hotel des Artistes in New York and as a movie producer in Hollywood. The book's title refers to his characteristic signature, in which the capital "S" of Stanlaws sits on a circle of contrasting color. Sections of the book detail the known magazine covers, magazine illustrations, magazine ads, sheet music pieces, book illustrations, blotters, fans, posters, trade cards and postcards, as well as the many print and calendar images, and his newspaper pieces. The book includes over 550 color images on 107 8.5x11" velo-bound pages, with a detailed index and price guide. The cost to US addresses is $40 by Media Mail or $45 by Priority Mail. Outside the US, contact us for a shipping quote.